i was in anaheim a couple weeks ago. i flew home after finals, and then returned a week later. that makes a lot of sense, right? (but um that’s nothing when compared to a couple summers ago, aka the time i flew home from socal, stayed at home for about 36 hours, then flew back down again). ANYWAYS. here’s a quick recap of my favorite parts of my oc trip. at the anaheim packing district (anaheim’s version of the grand central market, ferry building, chelsea market, etc), we tried a lamb roll, a pulled pork sandwich, blackberry ice cream, and short rib poutine. the poutine ($10), from the kroft, was hands down the best thing we tried there. it had fries topped with mushroom gravy, cheese curds, braised short rib and pickled red onion. the fries were the perfect doneness (creamy on the inside, crispy on the outside), the gravy was mushroom-y (and edible! normally i hate gravy), the short rib tender and flavorful, the cheese curds nondescript and not squeaky but i found myself not caring because they were melty and hey, 99% of cheese is better when melted. the pickled red onion added a fresh crunch and some acidity to break through everything else. it was super rich though, and i can’t imagine eating a whole order by myself. my other favorite meal on this trip was pokinometry. it was delicious: super fresh, high quality, silky fish. creamy imitation crab salad and avocado. crispy crunchy toppings. the only meh was the overly al dente brown rice. and for $10.75 for a large, it felt like a great deal, especially with 5 scoops of fish and a generous portion. 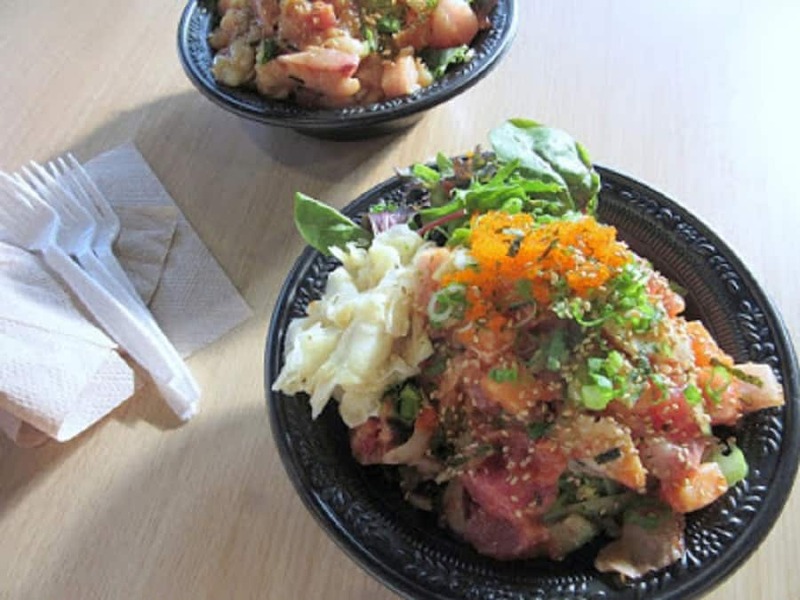 i’d say my fave 2 places to get this style of poke is pokinometry and uroko cafe (in costa mesa), though i also really like the poke salad at pacific catch (theirs is very different though, so i have a hard time comparing theirs with all the other poke shops around). and you can’t go to anaheim without a stop at disneyland. my mom and i went at 8am on a saturday, and the lines were great. it was hot and you could see everyone in the park wilting, but that’s socal summer for you. my favorites that day were hyerspace mountain (they re-themed space mountain with star wars), splash mountain, and the fireworks. also highly recommend the salted caramel mickey macaron from the jolly holiday bakery from the end of main street (though this one pictured above was tangerine, and decidedly not as delectable). just say the word and i can bombard you with plenty of recs (; would highly recommend sf (home to way too many places i love and would recommend in a heartbeat) if you have the time too! Looks like you had an awesome trip :)! What kind of camera do you use when you are on vacations like this? They look great. thanks scott! i use a canon sx600 hs. it’s a point and shoot, so it’s super easy to use (but you can get more advanced with it if you like, too). and it’s fairly clear (even when you max out the zoom!). What a great trip! I wish I could have been a stow away in your suitcase! I need to do more Anaheim treat trekking! Though I did get to Fugetsu-Do when I was in LA. They're precious.